Earlier in the fall, Anna announced she would be making a marionette for her Social Studies project this year. Every year the students are required to make a project for their Social Studies class that is on display for the spring Middle School Fine Arts Night. Last year the seventh graders made busts of historical figures. This year, instead of making a diorama as in years past, each student would make a marionette based on a historical figure or a character reflecting a particular region the students studied. Anna chose to make a Hawaiian dancer since the class studied the Polynesian countries. I knew we were in trouble when scanning through several puppet-making books at the library I read, “Do not attempt making a marionette unless you have made a puppet before. This is a very difficult project.” What??!! Anna started shaping the head before Thanksgiving Break, but I had no idea how the body would come together. Thankfully, we stayed home for Christmas this year and so did her Social Studies teacher, and he was more than happy to work with Anna and several other classmates on their projects. Each time Anna came home and showed me her progress, I breathed silent prayers of thanksgiving. This was not pieces of paper or fabric sewed together to fashion a body. No, this was wooden parts shaped by some sort of saw that I don’t even know the name of and screw eyes and bits of leather and foam all arranged to make a marionette’s body. Upon returning to school after break, Anna spent many afternoons in the workshop sanding, screwing, and forming hands and feet for the developing marionette. The week before the project was due was the most stressful. Every time I thought we finally had all the supplies we needed, Anna would discover we needed ONE. MORE. THING. In addition to making the marionette, we also needed to paint, clothe, and decorate said marionette. Thank God for Party City and Hawaiian-themed parties! 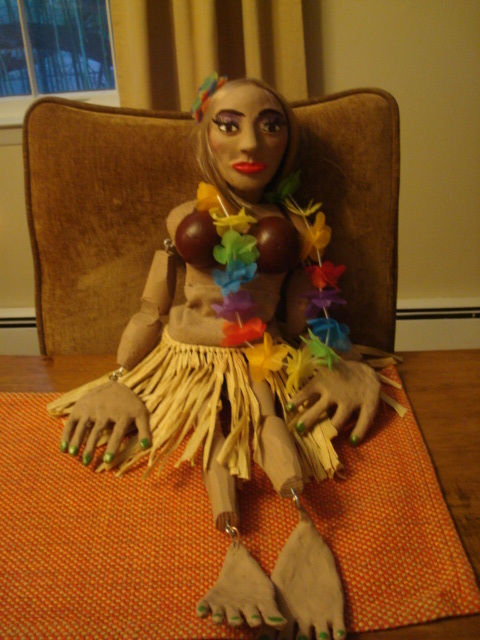 We found a grass skirt that we cut down to size along with a lei, and who knew that plastic Easter eggs could become a coconut top when painted brown and glued to leather strips! Finding hair for Lola was a bit more challenging—especially on the pocketbook. I didn’t want to pay $30 for a small strip of hair extensions when I probably needed at least three packs. We finally found some synthetic hair for $20 at Claire’s. This past Monday morning dawned and I carefully tucked Lola into a bag for Anna to take to class. I’m sure I wasn’t the only parent praying that nothing broke or fell off before the teacher had a chance to grade the project. Lola earned an A! I think I can safely say that my project-making years are behind me. I have officially paid my parental dues and graduated. (I haven’t shed a tear!) So far, the biggest project Jacob has had in high school was to make a cell for Biology and that only required a shoe box. Was this assignment worth it? I have my doubts, but I also know it’s too soon for me to answer. I will say that Anna did this project on her own. She worked hard and put in many hours and I think that counts for something. Glad you enjoyed the post! We can’t wait for you to come! Wow, great job to Anna, the face is very well done! I so enjoy reading your posts and getting a peek into your life. Miss you a ton my dear friend! Thanks, Dar, for your kind words. Yes, we like to keep our friends busy planning their next vacations. And, as an added benefit, we spread out in different locales! Miss you too.